Council for the MD of Pincher Creek No. 9 (MD) held a public hearing on the evening of February 9 to receive input on proposed Bylaw No. 1265-5. The bylaw is intended to the land use designation of a quarter section of land in MD Division 3 from “Agriculture - A” to “Rural Recreation 1 - RR1”, to allow for the establishment of a commercial / private recreational use, in order for the site to be developed as a youth camp, specifically the Camp Gladstone youth camp led by Heartland Community Church Pastor Donny Coulter and overseen by InterAct Ministries. The hearing was very well attended, with between 60 and 80 citizens present. Two people spoke to council directly on the issue, landowner Dr. Tom Liscombe in favor of the rezoning, and Student-at-Law Brian Hennings in opposition to it on behalf of 11 ratepayers. The meeting was chaired by Deputy Reeve Terry Yagos. Reeve Brian Hammond attended via telephone and all other members of council were present, as were CAO Wendy Kay and several members of the MD's administration. There were 24 written submissions on the subject received by council. 23 of those were opposed to the rezoning. 2015 was the camp's 20th year of operation. According to an InterAct newsletter, 127 campers were reported to have attended in 2014 and it draws up to 300 - 350 Native youth each year. The issue will be on the agenda for the regular council meeting of March 8, 2016 for further consideration. The camp has been the subject of dissension in the past as well. On June 2, 2015 the Municipal Planning Commission issued a temporary permit allowing it to operate last summer, to expire August 1, 2015, "after which time the temporary structures will be removed within two weeks of that date". The year before that, 2014, the camp operated without a permit. In regard to the 2015 temporary permit, a number of ratepayers expressed similar concerns to those outlined below and also expressed concerns about the short time period available at that time to address the issue. MD Planning Advisor Gavin Scott addressed the crowd prior to Liscombe and Hennings' presentations on February 9, 2016. Scott addressed some of the concerns expressed in the written submissions submitted to council on the subject. "It is not a public maintained road," said Scott, referring to the access to the site. "There are large leaps of faith that they would turn into much bigger, better, worse proposals, depending upon your point of view." "The intent of the Rural Recreation 1 district is to facilitate the development of commercial private recreation uses, at selected locations within the municipal district." "Land containment within the district shall be developed in a sensitive fashion, to limit or avoid compromising use of biology's natural attributes, natural aesthetics, and important scenic vistas"
"So I guess there is sort of the crux of the matter," continued Scott. "Is this the proper location for the proposed use? Are there attributes to this land that do not make it appropriate, or do make it appropriate? Is there a consideration that agriculture is taken out of production? Is this the best agricultural land? Is this an area that is sensitive, and needs to be observed? These are the things council needs to weigh." "As each individual is asked to speak tonight, I hope they can keep yourselves to the facts within the planning documents, and not stray from...I guess, your own personal feelings on other matters." Dr. Tom Liscombe spoke first and last at the meeting, as a proponent of the proposed rezoning. Liscombe sold the land to the Camp Gladstone group. "I serve on a number of foundations and boards, in a number of countries, and a friend phoned me with a few facts about Alberta youth, today. Twenty three percent of our kids, south of Calgary are offered sold, or given drugs at school. That's a quarter of the kids, almost. 42% of the kids admit to using drugs. 83% of grade 12 students use alcohol, and half of them binge drink. They are admitting that, so it may be a little higher. The suicide rate in the province at age 14, it goes up 500% when they are 15. Deplorable stuff. The one that really shocked me wasn't the pregnancies, and all the other stuff, it's the age of these kids. These are nine and ten year old little kids." Liscombe said what he found most shocking was that "Ten to twenty percent of our youth in this province have mental disorders. It's the second highest expenditure for hospital care for this age group. It's surpassed only by injury." "We know kids are in trouble. We humbly look to these kids, and give them four or five days a week for each age group, and we've kept it that way for 21 years. We have not expanded, the numbers don't go way up. It's a small one counselor typically to three kids. If you could see the joy on a little boys or little girls face as they're up on a horse and finally lose their fear, it's just a wonderful thing to see." He said he has been in contact with other groups to understand each others' programs. "Kids are in trouble, worldwide. We are trying to do our best right here in Pincher Creek." Student-at-law Brian Hennings said he was there to represent 11 landowners. "Let's be very clear from the outset, this is not an application to approve or deny a youth camp. This is about a whole group of individuals in this municipal district, rate payers, hard working individuals, who have bought into a parcel of land. Who bought into that believing that the use that they sought, remote, secluded from an urban center, would have some semblance of a rural agricultural life." Hennings said ratepayer concerns included a perceived increase in traffic of 5 to 10 percent, current rates, and potential incidents that might affect livestock and personal property. Another concern he raised is that a change in the land use bylaw would be 'for time immemorial', and that what started as a summer camp for children could with more permissions develop to become a larger stressor on the natural environment and create a potential for property damage. "I will implore upon you to consider that in approving or declining the application this evening, recall this isn't about a whole group of children. I would suggest to you that an enormous amount of our group is not actually opposed to the idea of a children's camp, in principle. What our group is opposed to is where it is being proposed, the fact that there are access issues... you have large, outstanding access issues." Hennings said Dr. Liscombe bought the land under an agricultural designation. "Now to impose on all of these land owners, ratepayers, citizens a use that takes away a lot of their amenity, a lot of their enjoyment, a lot of their privacy, for the benefit of a small group... it's not equitable, and I would suggest to you it probably falls afoul under the principles that you have to rely upon in exercising your discussion groups." Another concern Hennings raised was the proximity of a sour gas line to the site. He said Dr. Liscombe's plan did not include an emergency strategy, an egress strategy, or a secondary exit. "There are a number of issues here, and they fundamentally and they principally go toward safety, and security of people coming into the MD, and the residents around the proposed application site." There being no others wanting to speak, Dr. Liscombe was given the opportunity to speak once more. He addressed the concerns raised by Hennings on behalf of the opposing ratepayers. "We have an 11 passenger van, for small groups and also rent a bus, that's 30 passengers, we generally have 20 -25 kids, so they all fit on the bus. When we go to town, six tires are making dust. So there's sure not 100 cars, or 20 cars, or 10 cars. One bus. The sour gas line is on an adjacent property, and on our north line. It touches the far corner, almost. The proposed thing (area) would be more than half a mile, almost three quarters of a mile away. As you know you are not supposed to sleep within 500 metres, I believe, of a sour gas line. So we are double or triple that. Shell is very public about their setbacks. We've investigated with Shell and they have already gone through a lot of that stuff with us. The roads are up to MD Grade 2 standards. It's interesting to note when we did gravel the access road twice, one of the four users of that road, the only guy that didn't participate in the graveling is the absentee guy that's not there." In response to questions from council Liscombe said the camp had previously been located in Gladstone Valley, and at Brocket for one season. He said cost was a main motivation for relocating the camp, with rent at their Gladstone Valley site being raised to $20,000 for a month. "We don't have 20 grand," he said. Note: some of the following letters have been somewhat edited for length. Resident Jocelyn Mercer forwarded "a previous email submitted to you when the same same applicants attempted to get a development permit on adjacent property for a church camp. Mercer's most recent email said "Obviously my concerns regarding the rezoning (one is assuming in order to host a Christian camp for First Nations youth) are identical to those raised by this organization's former development application. The ethical issues surrounding a missionary style religious camp for First Nations youth, considering Canada's history with aboriginal youth, should require little further explanation and for this reason I cannot endorse the above rezoning. In addition, and I am sure you are quite aware, the precedent that such rezoning could have across the MD is somewhat alarming and seems out of context with the municipality's philosophy. In her original May 22, 2015 email Mercer said. in part, "I fully support the idea of getting our youth outside and connecting with the outdoors, provided all development and activity complies with environmental and safety regulations and appropriate regard is taken for dust control." Mercer continued "Mr Coulter's camp activities of archery, horse riding and storytelling are both wholesome and appropriate and his target audience is honourable. However, I was somewhat surprised that Mr Coulter' s letter to council informing of his proposal makes scant mention of the camp's religious agenda. Mr Milligan, I want this to be known; I am objecting the camp on moral and ethical grounds. In all documentation I have seen and from my understanding of Mr Coulter's occupation, Camp Gladstone is a Christian camp and a key focus of the camp is Christian teachings. Mr Coutler and his ministry are recruiting underprivileged First Nation Youth for a camp - the main purpose of which is to spread the gospel. I cannot be the only one left with a sour taste in my mouth - especially considering missionary history with our Blackfoot neighbours. Regardless of my own faith, the missionary focus of the camp feels wrong." In resident Bryce Sackett's email he said " I am closest residence in the application to change land use designation. My house is shown on the map. A few questions, perhaps you can point me in the right direction to get answered. The application acres shows 5 acres to be RRl. The package in the mail that i received, dated Jan 5 shows 350 x 200 meters. This would indicate 70,000 meters square, or 17.29 acres, or 7 Hectare. What would be factors in rejecting the land use to be changed? In the case of being rezoned to RRl, whats limitations are in place for future developments. Canthey build anything they want? This is a subdivision, i was to believe that a quarter can only be subdivide once, for a dwelling. I obviously have great concerns with this Camp Gladstone and need to find as much info as possible to "what the future" could look like this is area. As it is right outside my window. Literally." Jeff Dejax and family wrote "We remain concerned with the same things as before, regarding changing the use of the land(s) in question. The quietness and relative solitude of country living is extremely important to us. Please do not change this land use designation to recreational. There is abundant land north of the M.D. that would be completely and perfectly suited for the camp. We do support and encourage such camps. They just need to be situated according to good judgment." An email from residents Michael Gerrand and Michelle Spender said "I guess this won't come as any surprise but we just want to register our concern with the application for a by-law amendment change from Mr. Liscombe. We are disappointed that this has been raised again and have multiple concerns in regards to the inappropriateness of a zoning change and the ambiguity of the application." In addition to speaking before council Dr. Tom Liscombe wrote in defence of the application. In it he said "We are applying for a rezoning of a portion of the NE15-5-1- W5 to facilitate seasonal youth activities. This children's camp has been held for over twenty years at a average attendance of twenty-one local children per week for the four weeks of July in different locations. These numbers have purposely not been increased. Because this land has a remote location and varied topography , its forests are perfect for hiking, horse riding, camping and other nature related outdoor activity. It provides the opportunity for youth to learn about conservation, animal husbandry, wood crafting, and outdoor sports. As a livestock producer, the short time period and small acreage needed will have little impact on our ranching operations. It was pointed out by the Community Foundations of Canada's report on Southern Alberta, our zone maintained the highest provincial ranking as we focus on youth and "the sense of belonging" to a community. The first thing listed as supported by this foundation: before skate parks, ball diamonds, rodeo grounds, playgrounds and recreational centers was youth camps. With so many stresses on todays youth, I want to thank everyone of you leaders for your public service and your concern for our local children." Caron and Brent Kozachenko also wrote against the rezoning, saying "We support the retention of the existing Agricultural zoning on this land. Rezoning appears to create problems with existing subdivision bylaws, and may open the door to any allowable use in designated recreation zones. We would prefer to see the land use stay as it is." Ed and Pat Moskaluk wrote "There appears to be conflicting and missing information. They disputed the size of the proposed area to be rezoned, saying it was 17.3 acres instead of the 2 to 5 acres in the application. In addition they expressed access concerns. "The only road to the property appears to pass through someone's yard. Where will the road be?" They also expressed concerns about the quality of the map used to illustrate the area in question, possible effects on the natural environment, and a perceived threat to traditional ranching activities due to the fragmentation of agricultural and grazing land." "Owners of land change frequently and what may be a reasonable designation today could easily become incompatible in an area zoned agriculture, i.e. we could be faced with restaurants, recreation vehicle park, recreation facility. Furthermore, once a precedent has been set, anyone in the M.D. of Pincher Creek who chooses may justifiably apply for rezoning as well." Dr. Dennis Springhetti also wrote to express his opposition the the proposed change in land use. "The application as it is advanced contains several issues of considerable concern to our household and a large contingent of the surrounding community. The application notes it seeks a change in its land use designation from agricultural to rural recreational to be used as a youth camp." First, it cannot be understated how profound the effect of changing the land use of the proposed parcel from Agricultural to Rural Recreational will be today. It will allow a commercial level of traffic over a road designed for light residential and agricultural-related road use which will increase risks of human, property and livestock related vehicle collisions several fold. It comes with inherent and health safety risks to human life due to its proximity to a sour gas pipeline and the volume of people that would be allowed on a so designated property with limited access and no proposed emergency plan. In short, the proposed parcel is not appropriate to be designated as a Rural Recreational parcel today. All of this ought to be sufficient to cause the Board to decline this Application outright, without more. However, the most profound risks, I believe, lie in the future effects of this decision." "Second, the effects of the application being approved are potentially catastrophic for the community at whatever time the Applicant choose to discontinue the proposed camp or transfer the land altogether. Should the applicant or a subsequent purchaser elect to use the land designated as Rural Recreational as a campground, a recreational vehicle park or a festival ground, he would be fully entitled to do use with that land use designation. I implore you to consider that what is today being proposed as a children's camp may in months or years from now be a blight on the community bustling with recreational vehicles, fifth-wheels and the like. It would also gravely affect the safe, quiet, peaceful area that I currently call my home in an extremely negative way." Dr. Springhetti also expressed a belief that according to the MD of Pincher Creek Municipal Development Plan the land was not eligible to be designated rural recreational, and said the current road to the site "would not allow the volumes of young lives proposed to be in the area to be evacuated safely or in a timely manner", and other access concerns." "I believe the va1ue of my property financially and as agricultural land will be adversely affected by the designation of this land as RR 1. I am concerned that the increased traffic will cause more difficult and less safe trips in and out of the area. I am concerned that this development would directly or indirectly increase rates. I fear for the safety of myself and my guests as a result of increased traffic." Resident Michelle Spencer wrote "I would like to make you aware that as an MD ratepayer I am very concerned with the application from Mr. Tom Liscombe for the land use change." "I do not believe that this is in the best interest of the MD and sets a dangerous precedent throughout the MD." "I hope that Council will keep in mind that they are approving a land use change - and that this is not about the deficiencies or merits of the proposed camp. The current owner or subsequent owners are not obligated to continue with the camp once the land use change is approved. Looking at the land use change and the development permit at the same time makes the issue very murky and I think the MD is on shaky ground letting this application go ahead as presented." "I am surprised given the current mood around Bill 6 and the strong feelings that the agricultural way oflife needs to be protected that the MD is considering going down this road. I think the MD has misjudged how unpopular a decision this would be." Alberta Wilderness Association (AWA) Conservation Specialist Sean Nichols sent an email detailing AWA's concerns about the proposed bylaw change. It states in part that AWA "was contacted earlier this year by supporters in the Pincher Creek region who are concerned about proposals to develop a seasonal wilderness children's camp on a site within the Municipal District." "AWA shares the concerns of our supporters about the proposed development in a sensitive area that falls within one of AWA's long-established provincial Areas of Concern." "Although AWA is supportive of initiatives that encourage youth to spend more time in the outdoors, we share the concerns of our local supporters about the appropriateness and location of the proposed development, and its potential impact on such sensitive lands." "The site in question, we note, is located within areas identified as being of "National Significance" in the 2009 Fiera Provincial Environmentally Significant Areas report." "There seems to have been little attention paid to the issue of cumulative effects, which can have a significant effect on sensitive landscapes, and while we understand the limited scope of the camp as initially proposed, we are particularly concerned about the possibility for future expansion and the effect that expansion may have on the ecosystem. The rezoning being proposed would permit a youth camp on the parcel, but would also permit other uses listed in the Land Use Bylaw, such as the construction of a small resort. This latter would be an entirely inappropriate land use for this area." "As is often the case with proposals of this nature, AWA is also greatly concerned over the precedent that it may set for future applications (whether by the same applicant or otherwise). Once one is approved, future proposals become significantly more difficult to turn down, which would exacerbate the cumulative effect on the ecosystem, and fundamentally change the nature of the region. With a large extent of nearby lands currently being proposed for the Castle Provincial Park and Wildland Provincial Park, it is foreseeable that there will be significant future pressure to allow for similar types of recreational development in the area." "We also share the concerns of a neighbouring landowner, expressed to us, about the nature of the area as wildlife habitat, and specifically the fact that there are known grizzly dens on lands immediately adjacent to the proposed camp. The potential for conflicts between grizzlies and young camp attendees raises questions about the wisdom of allowing this type of activity in this place." "Without clarifications about size and proposed use, limits on capacity, and attention paid to cumulative effects AWA is concerned and opposed to the bylaw change. The current Agricultural designation remains more protective of the significant features than the proposed change to Rural Recreation." "AWA is requesting that you register our interest and concern with the development and that you please keep us informed of your plans as this proposal is reviewed." 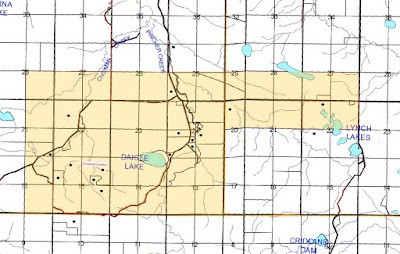 Nature Conservancy of Canada (NCC) Natural Area Manager Rylee Osadczuk wrote that NCC "would like to respectfully submit information on the conservation planning and activities that have been undertaken by our organization and regional landowners, which could be impacted by the proposed land re-designation application listed above, within the Municipal District of Pincher Creek No. 9. It is our hope that members of the council will use this information to assist in the county's deliberation on this proposed bylaw change." "NCC was founded in 1962 and is now Canada's leading land trust in preserving high value conservation lands across the country. We have been active in the Municipal District of Pincher Creek No. 9 since 1994, with a number of internationally recognized conservation actions on the ground; such as the 35,000 acre Waterton Park Front project and the 30,500 acre Waldron project (of which most of these are within the M.D. of Pincher Creek). Our work in this area supports working landscape conservation objectives and views sustainable ranch operations as compatible with these goals." "Through the gradual acquisition of conservation easements and simple properties of lands surrounding Beauvais Lake Provincial Park and Christie Ridge NCC, other organizations and regional landowners are protecting these areas which are important for healthy watersheds and wildlife corridors of the Castle River and the Pincher Creek." "The lands currently being considered by this proposed bylaw change have been assessed as having high conservation value. These lands are located. 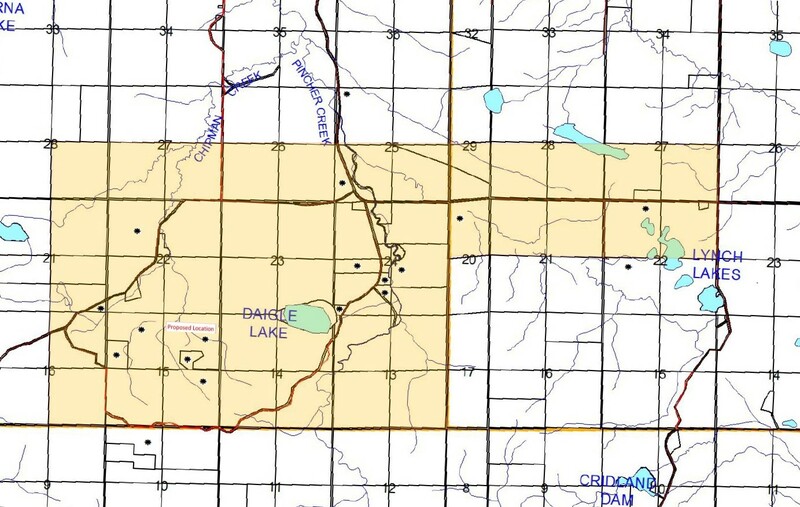 within a critical corridor between Beauvais Lake, Christie Ridge and easement and conserved fee simple lands south of the town of Pincher Creek. Development of these lands, as is being proposed under this bylaw, would have a negative impact on the considerable conservation work the local ranch community has already started with NCC and other land trusts." (I/We) write to register my opposition to the above-described application for change in land use. The application as it is advanced contains several issues of considerable concern to our household and a large contingent of the surrounding community. The application notes it seeks a change in its land use designation from agricultural to rural recreational to be used as a youth camp. First, it cannot be understated how profound the effect of changing the land use of the proposed parcel from Agricultural to Rural Recreational will be today. It will allow a commercial level of traffic over a road designed for light residential and agricultural• related road use which will increase risks of human, property and livestock related vehicle collisions several fold. It comes with inherent and health safety risks to human life due to its proximity to a sour gas pipeline and the volume of people that would be allowed on a so designated property with limited access and no proposed emergency plan. In short, the proposed parcel is not appropriate to be designated as a Rural Recreational parcel today. All of this ought to be sufficient to cause the Board to decline this Application outright, without more. However, the most profound risks, I believe, lie in the future effects of this decision. Second, the effects of the application being approved are potentially catastrophic for the community at whatever time the Applicant choose to discontinue the proposed camp or transfer the land altogether. Should the Applicant or a subsequent purchaser elect to use the land designated as Rural Recreational as a campground, a recreational vehicle park or a festival ground, he would be fully entitled to do use with that land use designation. I implore you to consider that what is today being proposed as a children's camp may in months or years from now be a blight on the community bustling with recreational vehicles, fifth-wheels and the like. It would also gravely affect the safe, quiet, peaceful area that I currently call my home in an extremely negative way. Please, when making considerations regarding this Application, recall this is not about approving or denying a children's camp. It is about allowing the land that is the subject of the Application to be used in a fundamentally different way forever, and in a way that is not at all aligned with surrounding Agricultural lands and their homesteads. The land is not capable of being further subdivided. It already has a homestead subdivision, which means it cannot have a further subdivision and be compliant with the MOP. I believe the parcel must be subdivided before that subdivided smaller portion can be designated RR1. I believe the value of my property financially and as agricultural land will be adversely affected by the designation of this land as RR1. I am concerned that the increased traffic will cause more difficult and less safe trips in and out of the area. I am concerned that this development would directly or indirectly increase rates. I believe the camp should be allowed to operate within the MD, but in an area already designated as RR1 or in an area that has been identified in the MOP as being a proper parcel for RR1 Designation. I am concerned about what future uses may precipitate from the redesignation of this land's land use. On all of the above, we do not believe that the proposed property is an appropriate property to be designated Rural Recreational 1. We respectfully request that you dismiss the Applicant's application for a change to the Land Use By-Law 1140-08 to permit the RR1 designation of the Applicant's land. I believe that the corresponding risks far exceed any benefits to the land or the community. "We write on behalf of several landowners that represent ten households within your Municipal District who have retained our firm to oppose the proposed Change to Land Use By-Law 1140-08 ("LUB") as advanced by Dr. Thomas J_ Liscombe (the "Applicant") in his Application dated October 20th, 2015, and its related Amending By-Law 1265-15. The application as it is advanced contains several issues of considerable concern to our clients specifically and a large contingent of the surrounding community stakeholders generally. The application notes it seeks a change in the subject land's land use designation from Agricultural to Rural Recreational1, to be used as a youth camp. By delivery of this letter, we provide notice of our intentionto make oral and written submissions on behalf of each and all of the individuals or households, a list of whom are attached to this letter, on February 9, 2016 at 6:30PM. As you may be aware, our firm has been involved in this matter since the Subdivision and Development Appeal Board's decision DP 2015-30 refusing a Development Permit on an adjacent parcel held by the same landowner in the Board's decision dated July 23, 2015. We note that decision provides that the use applied for in that DevelopmentPermit was found to be "Commercial/PrivateRecreation"and therefore that use was incongruentwith Agricultural designated lands, which aligns with section Vlll.A.2.3 of the current LUB. Our clients' position is that the use is, and remains, inappropriatefor the surrounding area and the applicationto change the LUB should be refusedfor the reasons that follow below. The application as proposed, in our view, raises some concerns. The subject land is currently zoned for agricultural use under the LUB and Municipal Development Plan 1062-02. The application includes a very nebulous part of NE-15-5-1-W5,which was originally indicated as being 3-5 acres. The application map that has been provided to homeowners by you on behalf of the MD of Pincher Creek indicates that the area to be designated Rural Recreational 1 by the Amending By-Law 1265-15 is 17.29 acres. We note that there is already one parcel subdivided out of NE-15-5-1-W5for a residence; on the basis of the LUB and the MOP at section 3 (R), an Agricultural parcel previously subdivided for a homestead cannot be further subdivided. It also states that "a subdivision application which proposes to subdivide one or more lots proposed for industrial [commercial] use may be approved in the Rural Area, but such· an application shall not be approved unless the land which is the subject of the subdivision application is designated for grouped or multi-lot industrial [comrnercial]development in the land use bylaw." On the basis of the Board's own previous characterization of the Applicant's intended use and the current designation of the subject lands, it is our positionthat Council is required to refuse this application. It is not clear in the application if the 17.29 acre subject parcel would be subdivided out of NE-15-5-1-W5 prior to its land use designation being changed, which in our view the MOP and current LUB require. The only scenario in which either the LUB or MOP contemplate a change in land use designation is where an entire existing parcel is to be rezoned, or, subdividing a parcel and rezoning the subdivided lot. Zoning a portion of a previously zoned parcel, already subdivided, does not fit in either of these scenarios. In any event, it is our clients' position that allowing a land use designationover an unspecific portion of a parcel, or within a differently designated parcel, as the applicationseems to propose sets a dangerous precedent. Such a zone would be very difficult for anyone to separate from the parcel's remainder, and therefore nearly any part of the larger Agricultural parcel could be used as the "RR1 zone" within the otherwise Agricultural designated land. To further add to the confusion, the portion proposed by the Applicant does not abut one of the parcel's pre-existing boundaries,which is a requirement of the MOP. The MD of Pincher Creek MOP affords considerable protection to Agricultural designated lands, and their ongoing preservation.The MOP at part Ill states that "extensive agriculture shall be the predominant land use in the MD of Pincher Creek, and that the [LUB] shall facilitate the continued viability of agriculture in the area." It further adds that "the protection of agricultural lands shall be considered when decisions about non-agricultural land use are being made." Section 3 further states that: "commercial/private recreation shall be permitted under the Land Use Bylaw in the Rural Area only in land use districts intended for these uses. However pre-existing commercial/private recreation shall be zoned appropriately to permit this continued use." There are at least four areas within the MD of Pincher Creek currently zoned for Rural Recreational 1 use. NE-15-5-1-W5 is not one of them. The landowners should not be required to forgo any portion of their amenity or any part of the uses approved on their land so that the Applicant may enjoy a use on his land for which that land was never zoned and never intended. One of the largest concerns of the landowner group is that future uses cannot be circumscribed or guaranteed to remain as what is applied for today. Should the Applicant or a subsequent purchaser elect to use the land designated as Rural Recreational 1 as a campground within the meaning of the LUB sections () would be fully entitled to that use with that land use designation. He may also choose to make an application for a discretionary use, such as a recreational vehicle park or a festival ground, which our clients believe would be completely incongruent with the lands intended use. We implore you to consider at this juncture that what is today being proposed as a children's camp may in months or years from now be a blight on the community bustling with recreational vehicles, fifth-wheels and the like. It would also gravely affect the safe, quiet, peaceful area that the landowners currently call their homes. We respectfully request that the Council, when making considerations regarding this application, recall this is not about approving or denying a youth bible camp. This application does not include a Development Permit, which some of the ancillary proposed uses may ultimately require. We suggest to you that even if it did, it could not be considered because sufficient time has not passed since the Applicant's previous application for a Development Permit. Instead, this application for a change in land use designation is about allowing the land that is the subject of the application to be used in a fundamentally different way forever, and in a way that is not at all aligned with surrounding Agricultural lands, their homesteads or the applicable law as it is outlined in the current LUB or the MOP. In short, the Applicant proposes to change the land use designation of a parcel of land that is currently not capable of being designated Rural Recreational 1 for a number of other ancillary reasons. It is potentially inside an exclusion zone for an H2S sour gas pipeline. While the level of the nearby pipeline is not currently independently ascertained by our office, our understanding is that it is a level 3 or level 4 pipeline. If it is a level 3 or 4 pipeline, this application may require concurrent or prior approval of the Alberta Energy Regulator. It has, and continues to have, access issues. To enter the Applicant's land, individuals must cross property that is currently accessed by private easement. That easement does not contemplate commercial uses. It may also not have public road access at all depending on where the subject land is ultimately situated, which is generally required for all commercial uses by the MOP and the LUB. Finally, the subject land is not capable of being further subdivided. It already has a homestead subdivision, which means it cannot have a further subdivision and be compliant with the MOP. We believe the parcel must be subdivided before that new smaller subdivided portion can be designated Rural Recreational 1, otherwise either the dwelling lot or residual lot must be zoned in its entirety as Rural Recreational 1. On all of the above, we submit to Council on behalf of our clients that the subject property is not an appropriate property to be designated Rural Recreational 1. Our clients believe that the corresponding risks of changing the land use designation far exceed any benefits to the land or the community. We respectfully request that you dismiss the Applicant's application for a change to the Land Use By-Law 1140-08 to permit the Rural Recreational 1 designation of the Applicant's land." "I was there when I was 10 years old and it's a good thing because in Brocket, these kids' home, they don't have that much," former camp attendee and counselor Otys Potts told me after the meeting, which he attended in support of the rezoning. "They don't get that chance to go and pay $300 - $400 apiece. They made it affordable for everybody in the community who wants to take part of it. They aren't trying to take over anything. They are in and out, minimal damage, all that stuff. I have never seen any damage to personal property, I have never seen that out there for close to 14 years." "I can get why they'd be mad, seeing everybody trying to come in, but it's not taking over. It's there for a couple weeks, then gone. That's it."